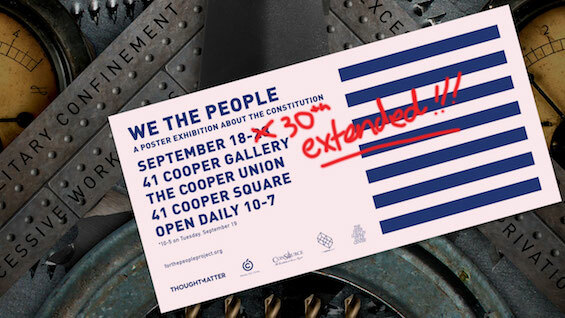 Creative branding and design agency ThoughtMatter, designer Mirko Ilić and The Constitutional Sources Project (ConSource) have collaborated to curate a poster exhibition to celebrate Constitution Day (September 18). Twelve prominent and influential designers from across the nation have taken on the challenge of designing a poster about one of the amendments that make up the Bill of Rights or the Preamble to the Constitution. The exhibition features work by Paul Buckley, Yue Chen, Seymour Chwast, Mark Fox & Angie Wang, Milton Glaser, Kit Hinrichs, Jessica Hische, Jonathan Key, Elizabeth Resnick, Edel Rodriguez, and DJ Stout. The exhibition is part of the For the People Project, an initiative to get copies of ThoughtMatter’s newly redesigned Constitution books into the hands of as many of the nation’s students as possible. The exhibition will be open daily from 10 a.m. – 7 p.m., except for Tuesday, September 19, when it will be open from 10 a.m. – 5 p.m.